bedkits to children in Kenya. Imagine yourself sleeping on hard ground every single day of your life, and then suddenly someone gives you a bed-kit -- a mattress, pillow, sheet, blanket and mosquito net -- the recipe for a comfortable sleep. How would that make you feel? Megan Johnson has been imagining that ever since she first donated her first $30 for a bed-kit from the Sleeping Children Around the World charity. "I gave it as a gift for my dad's 70th birthday," said the Oakville Place general manager. "The idea is actually really neat. You give the charity $30, which allows them to buy a bed-kit for a child. The child is then photographed with their new kit and a label that either has your name or a message." Now, 10 years after her first donation, Johnson was due to leave for Kenya yesterday with five other volunteers from Sleeping Children Around the World, to witness the children's reactions herself. "I've just always wondered how they would react. Would they know what a mattress is? How would their first sleep on a mattress feel like? I'm just really excited to see their faces. I bet it probably feels just like heaven to them." During her two-week stay, Johnson, along with the rest of the volunteer team, will be distributing 6,500 bed kits. "That's 6,500 children who'll be going to sleep happier," she said, smiling. There are specific criteria however that enable certain children to be more likely to receive a bed-kit than others. According to Johnson, a child must be attending school and have at least one working parent. She also said that the Rotary Club of Kenya selects the children and the charity organizes the manner in which the bed-kits are distributed. "They gather the children in one area and talk to them a little bit about the charity and what's going to happen. Then they give them a fresh pair of clothes, their bed-kits and take their picture." Johnson also added, that the point of the process is to make the children as comfortable as possible, because this experience, is often, very new to them. She recalled a story that a pervious traveller had told her about his own personal experiences with the trip. "He was taking the pictures, and as he would take the pictures he would tell the children to smile. However, in this country, every time he said the word smile, the children would look around, confused, and walk towards him," she laughed. "He kept thinking, what the heck am I saying that's making them come. And apparently the word smile, sounds a lot like the word come here in their language. So while he wanted them to smile, they thought he was asking them to move towards him." Because the charity has a zero overhead policy -- that is, it is completely operated by volunteers -- Johnson is paying for the trip and its expenses from her own pocket. "I've always been a traveller. I think that traveling for the sake of travelling is great, but I think travelling for a cause is just something totally different. That's why I'm going," she explained. Johnson applied for the volunteer trip a year-and-a-half ago. She was accepted in March. She first heard about the charity from an announcement made at her church, and she has supported it, ever since. "It's one of the quiet charities that I want to give my attention to, so that it won't be forgotten," said Johnson. "It's simple, no one phones you and no one knows how much money you donated." The charity was founded by Margaret and Murray Dryden in 1970. Murray realized that a bed should be the basic right of every child, during the Great Depression, when he slept many nights without a bed. Since 1970, the charity has raised more than $20 million for bed-kits for more than 900,000 children in 32 countries. The Teachers Credit Union from the Hamilton, Ancaster, and Brantford Branches donated $500 to Sleeping Children Around the World to purchase some bedkits. 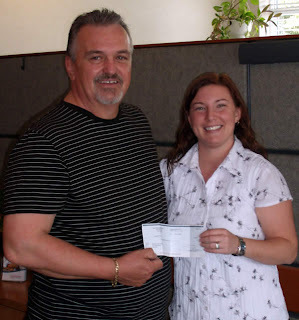 Emilie Hyde, the Financial Services Representative, from the Brantford Branch presents the cheque to Mike Foster a travelling volunteer with SCAW and also a member of the Brantford Teachers Credit Union. Mid-Life Riders Online, a charity motorcycle group will be having a ride on June 7, 2008 and all money raised from this ride will be donated to SCAW for bedkits. Mid-Life Riders Online is a new group and we are committed to having the MLR ride for SCAW every year on a go forward basis. We will make the donation online once the numbers are in as well as send a group photo of the riders and bikes for your records. Keep up the great work. Read more at the club's website. Centre Peel Public School in Drayton, Ontario raises $2,100.00 for Sleeping Children Around The World. A very successful coin drive and a well-attended community spaghetti supper, with over 250 people sitting down for dinner at the school on April 28th, resulted in Centre Peel P.S. raising enough money to purchase seventy bedkits. 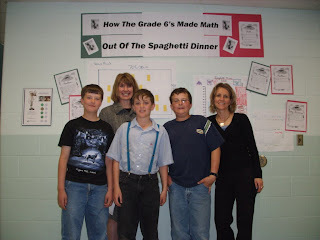 Mrs. Kuchma and her Grade Six students were the organizers for these events. Wonderful support from the community, all students and teachers resulted in a huge success in their fundraising.